While the final table of Event #10 ($10,000 Seven Card Stud) was on its dinner break, Michael "The Grinder" Mizrachi (left) took his seat next to ESPN columnist Bernard Lee to play Event #14 ($1,500 2-7 Draw Lowball). 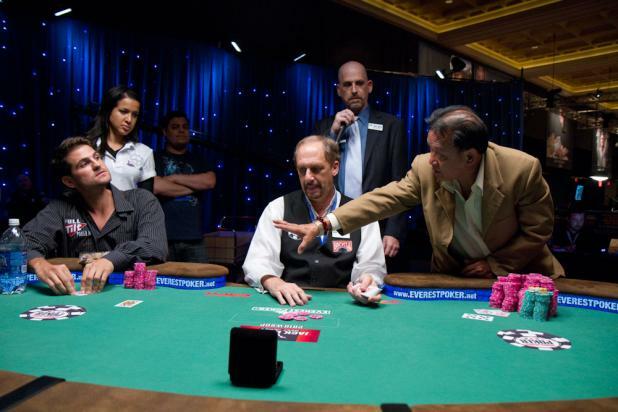 Mizrachi's stack had been blinded off, and when he first sat down he announced, "I'm going all in on every hand in the next 10 to 12 minutes." He did just that in his very first hand, and caught a lucky draw to double through his first opponent. Mizrachi's attitude and the entire situation was cracking up Lee, who was laughing continuously for more than a minute. 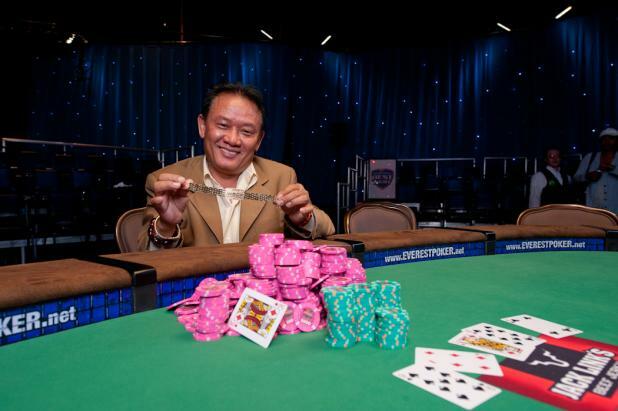 Men Nguyen earns his seventh WSOP bracelet, moving into a three-way tie (with Phil Ivey and Billy Baxter) for sixth place on the all-time list. After the victory, Nguyen said, "Every time I make a speech or get into an interview, I want to thank the United States of America for giving me this chance." Born in Vietnam, Nguyen chose to have the U.S. national anthem played at his bracelet ceremony the following day. 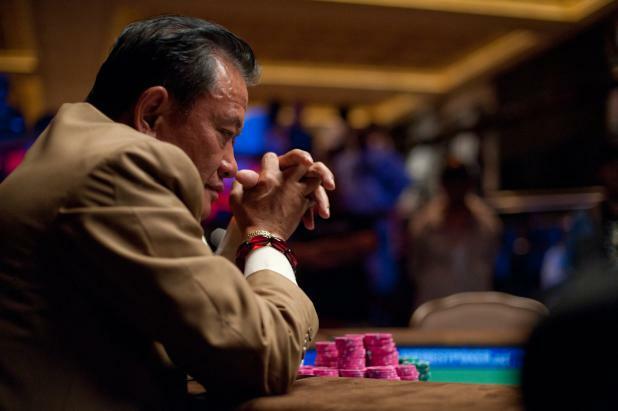 Nguyen also said, "I have not won any tournaments here at the Rio. When they moved the [WSOP] here in 2005, I missed the Horseshoe. I felt very good playing there. But I am superstitious. I thought when it moved here, it was very hard for me to win." 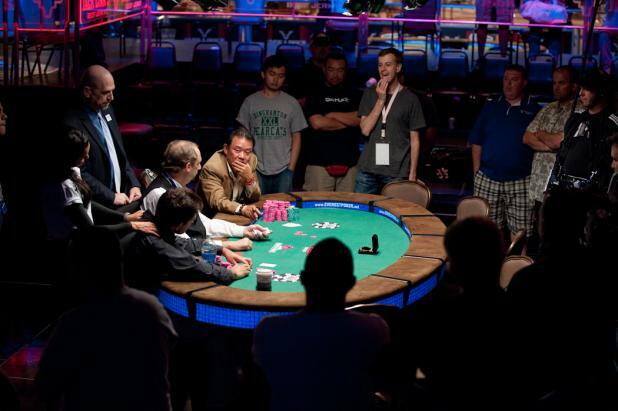 Men Nguyen peels back the far corner of the card, giving a glimpse to the camera and the railbirds. 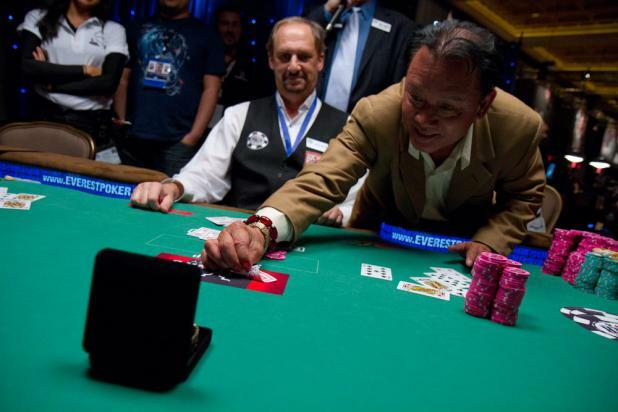 If you look close, you can see it's a king, which gives Nguyen a pair of kings to win the pot -- and his seventh WSOP bracelet. Is It Possible to Slowroll Yourself? 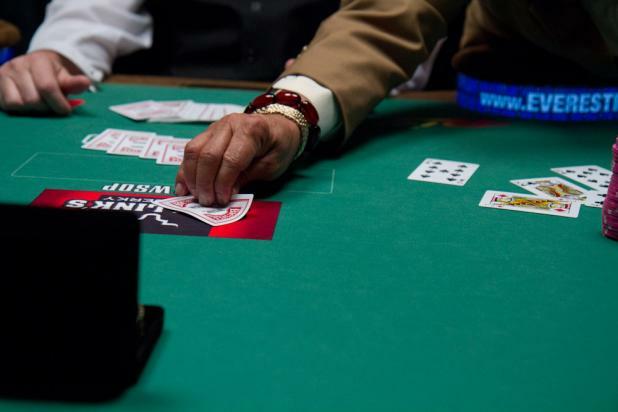 To drag things out even longer, Men Nguyen takes a peek at the blank corner of his seventh card, announcing to everyone that if the card isn't paint (a king, queen, or jack), he lost the hand. If it is paint, then he wins on a king or a queen, and loses on a jack. After he takes a peek, Nguyen excitedly announces that it's paint. Brandon Adams quickly flipped over his seventh card to show As-3d-Qh-Qc-5s-6c-9d for a pair of queens. Men Nguyen's first six cards were 9s-6d-10s-Kc-Jd-4c for a gutshot straight draw with one overcard. 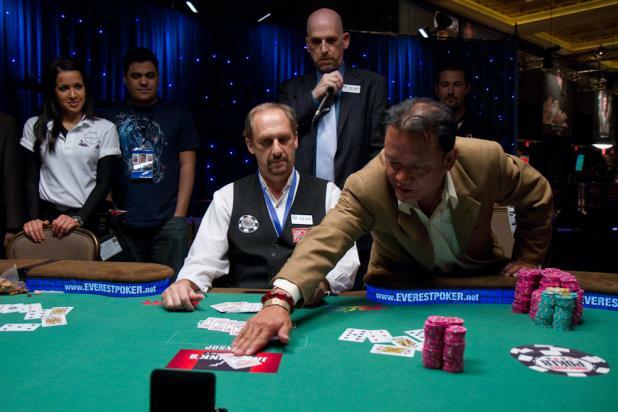 Nguyen needed a king (for a higher pair) or a queen (for a straight) to win the pot -- and his seventh WSOP bracelet. With a big chip lead, there was no pressure on Nguyen, but he played up the drama anyway, moving his final card to the center of the table before he would look at it. Once Brandon Adams (left) and Men Nguyen were all in, they flipped over their hole cards. Adams had the lead with As-3d-Qh, while Nguyen showed 9s-6d-10s. Adams paired his queen on fourth street to take the lead, while Nguyen picked up a gutshot straight draw with one overcard on fifth street. The ESPN stage has a completely different atmosphere when the TV cameras aren't around. Without a large crowd, fans are allowed to get closer to the action, and reporters stand tableside to record the action. 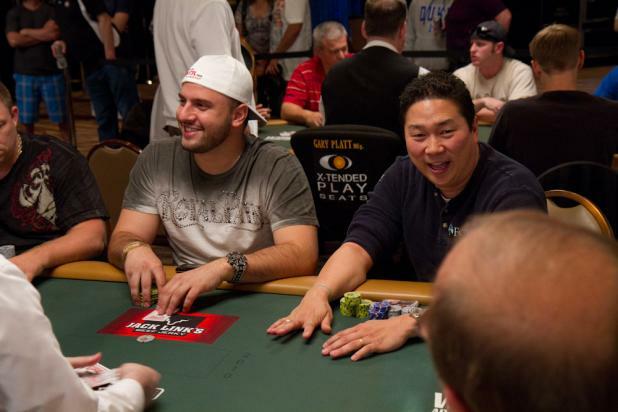 Men Nguyen is among the career leaders in WSOP bracelets, coming into 2010 with six. 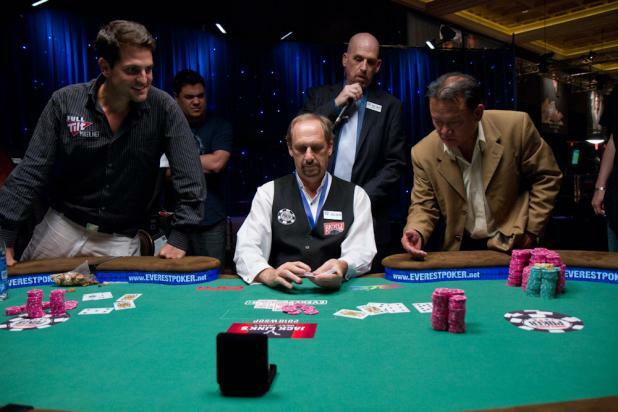 However, he hasn't won a single bracelet since Chris Moneymaker won the WSOP Main Event, widely regarded as the start of the poker boom. 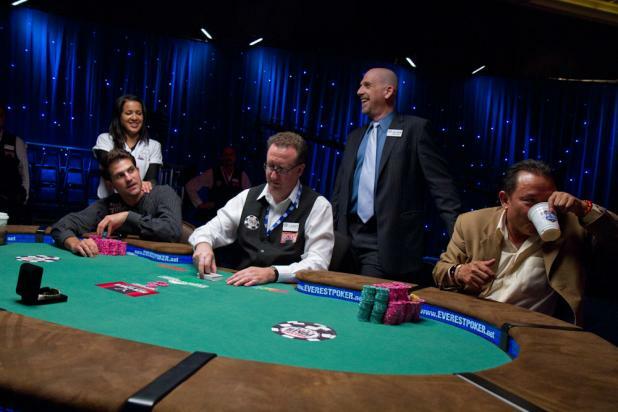 In fact, he hasn't had much high-profile success since then, even though he won Card Player's 2005 Player of the Year award (racking up an unusually high number of points in smaller buy-in events).